The visit to Lo Manthang, in particular, is truly mesmerizing on account of its 13th century Royal Palace, Jampa and Thubchen gompas prominently circled by whitewashed mud-brick walls. 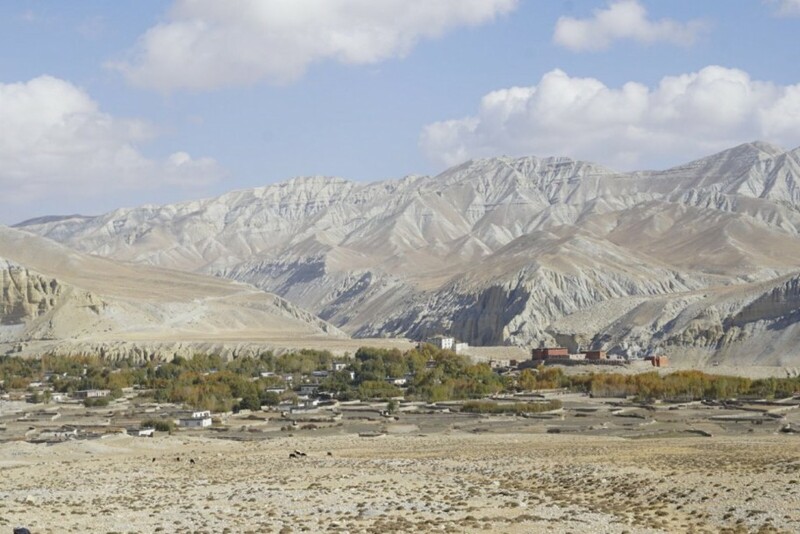 Lying to the north side of massive Dhaulagiri and Annapurna peaks, for centuries Upper Mustang remained a forbidden trans-Himalayan kingdom until it was opened for tourism activity in 1992. 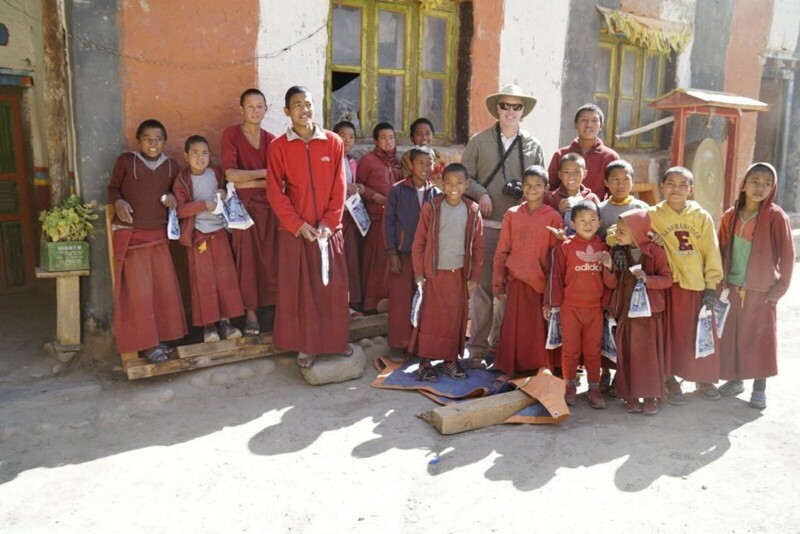 A special permit is required to do Upper Mustang Trek, which includes a visit to the capital of Lo Manthang (3840m). 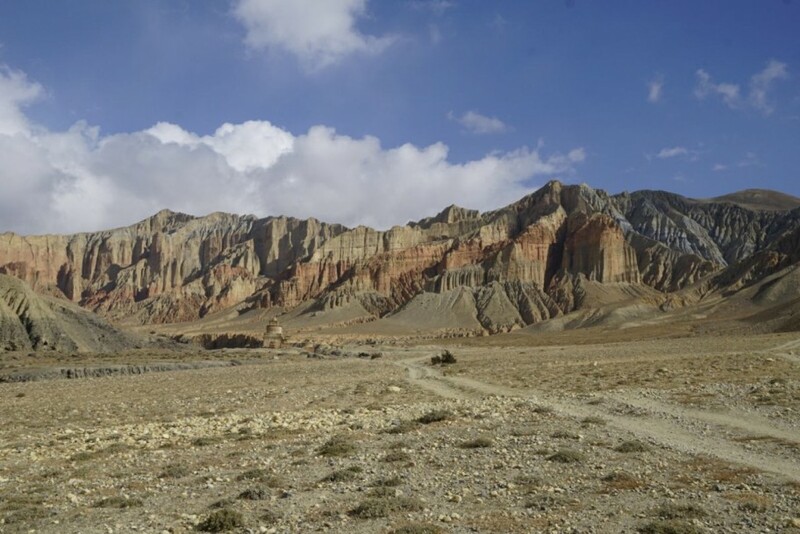 The whole area of Upper Mustang and its impressive geological formation has an isolated and mystical feel to it, enchanting and inspiring visitors to this region. The culture, language, and customs of Mustang people are closely related to their Tibetan cousins. 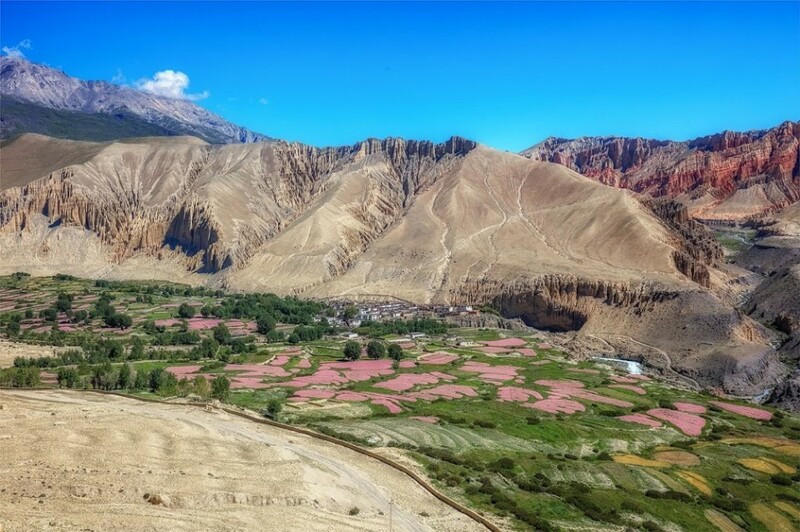 Against the unique and barren landscape of Upper Mustang, are colorful cliffs, palaces, secret caves, and ancient Buddhist shrines. The visit to Lo Manthang, in particular, is truly mesmerizing on account of its 13th century Royal Palace, Jampa and Thubchen gompas prominently circled by whitewashed mud-brick walls. You can also visit nearby cliffs to observe centuries-old Buddhist scripts, pottery shards, mural paintings etc. 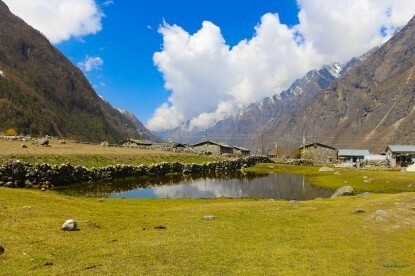 The towns of Kagbeni and Jomsom (Dzongsak) on the bank of Kali Gandaki river is the home of entrepreneurial Thakali people, famous for Apple brandy and Thakali cuisines. 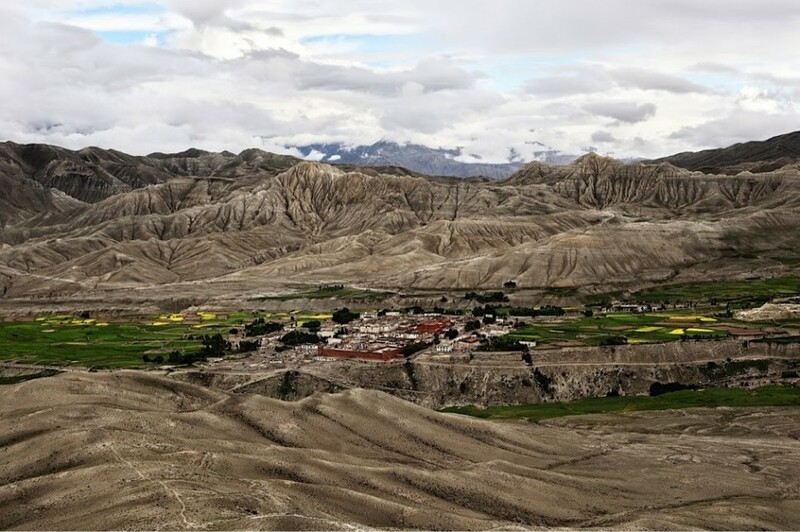 All along the Upper Mustang trekking trail offers splendid views of Nilgiri (7061m), Manaslu (8,163m), Annapurna(8091m) and Dhaulagiri (8167m). 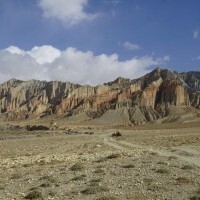 The best seasons for Upper Mustang trek is in Spring (Mar-May), Autumn (Sep-Nov) or Monsoon (June-August). The famous 3 days Tiji Festival that takes place every spring in Lo Manthang is not to be missed. We meet you at Airport & transport by private vehicle to comfort hotel. You will have leisure time, followed by an evening welcome dinner at a typical Nepalese Restaurant and discuss the trip, in Kathmandu overnight (1,300m/4265ft.). Half-day Cultural city tours, Kathmandu Durbar Square, Pashupati Nath, Syambunath & Buddha Nath- Buddish & Hindus temples - The biggest Buddha Stupa, Bhaktapur Durbar Square, Patan Durbar square in Kathmandu valley. Afternoon trekking Guide (Sherpa) will come to meet you for next day departure Information at a hotel, in Kathmandu (1,300m/4265ft.). 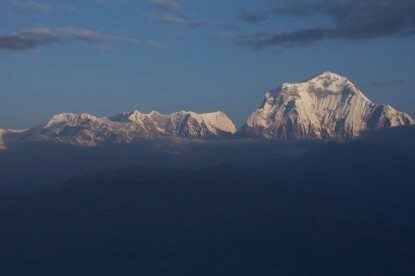 Fly 35 minutes or drive 5 hours to Pokhara. Walk around the Pokhara city and enjoy the view of the mountains and beautiful lake Phewa lake. Stay overnight in Pokhara at the hotel. Early in the morning fly to Jomsom then trek to Kagbeni. 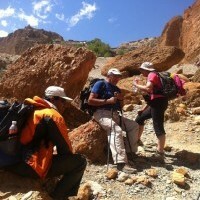 This is quite a short day so you get early to Kagbeni so after lunch we go to walk in Kagbeni village and monastery. This is a really beautiful landscape in the bank of Kali Gandaki river. Stay overnight in Kagbeni village. It’s about 6 hours walk to Chele. The trail follows the Kaligandaki valley through the Tangche, Chhusang at the confluence of the Narshing Khola and the Kaligandaki. 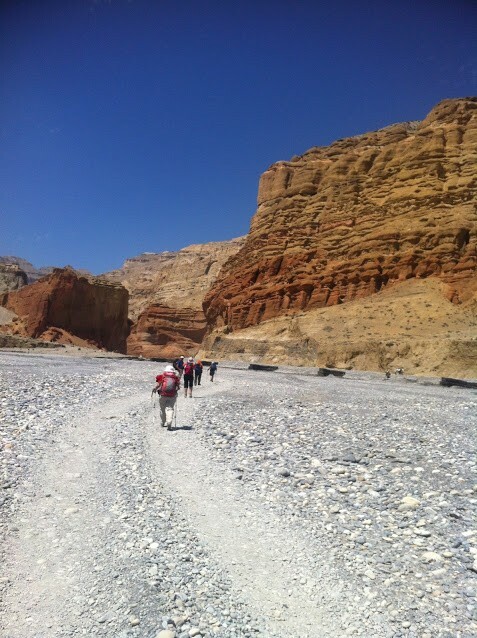 The trail continues north before crossing the river and climb up to Chele which is an incredible place with quite a dry land and you can see the Tibetan Buddhist culture. Stay overnight in Chele. Chele to Gheling(3440m./11286ft.) 6-7 hrs. It’s about 6 hours walk to Gheling, walking in wide and beautiful dry land with view of the white smiling mountain. Today trail goes up and down and today you will cross some high hill or pass as well like shyangmochen pass 3700m./12139ft. and descend the right sight then you will reach the Gheling. Stay overnight in Gheling. It’s about 5 to 6 hours walk to Tsarang. Today is gently up through the wide valley and you will reach the Nyi La at 3952m./12966ft. then we descend the trail. After walking a while we will reach quite a big village called Ghami. Then cross the bridge of Dhakngmar Chhu river and after that, you will reach long mani wall then cross another pass and descend into Tsarang at 3490m./11450ft. stay overnight there. It’s about 5 hours walk to Lo Manthang. 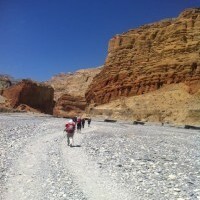 Today is the day that we will reach the destination of our trek and city of the Mustang valley. You will descend from the Tsarang and cross the Tsarang Chu then you will climb up again and first you will see the view of the Lo Manthang. Lo- Manthang is surrounded by a wall and there is a nice gate to entry the Lo Manthang. It’s a traditional and beautiful tiny city of the mountain. There and so many things to see and many places to visit. You will enjoy being here. Spend two or three night here. There are many things to see so you will enjoy the being here extra days. There is much fascinating ancient building to visit here. There is temple as well as king palace of Mustang district. Visit the monastery and many incredible things and see their real Tibetan culture, houses, a lifestyle which makes you happy and you will realize lucky to being here. Stay overnight there. It’s about 6-7 hours walk back to Ghami. After enjoying the nature, culture, people, and religion of the Mustangs incredible experience you will walk back down to Dhakmar. 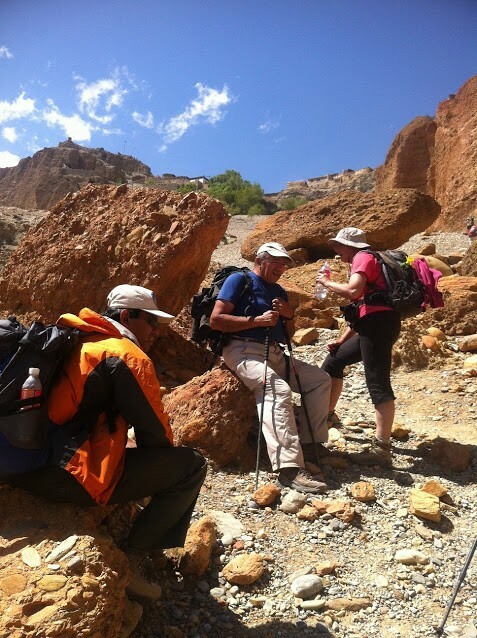 We take you different trail through the Lo Gekar along a local trail and afterward you will reach the Ghar Gompa, which is one of the oldest active gompas of Nepal. Then pass the hill and head down to Dhakmar and to Ghami where stay overnight. It’s also such a great walk down to the Chhuksang with an incredible view and pass the few villages and trail continue eastern bank river after the cross the river and finally you will reach Chhuksang and spend a night there. 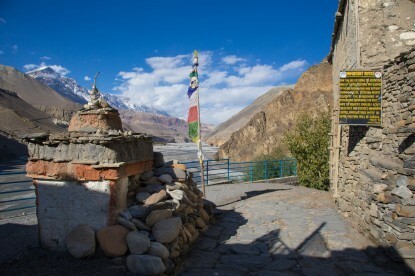 Today you will reach Muktinaath the holy place of the Hundu and Biddhist where located one of the famous Hindu temple Muktinaath and Buddhist monasteries. While you are walking today you will pass many different villages and enjoy the walking with closest and front view of the beautiful mountains Nilgiri, Dhaulagiri etc. Visit the monastery and temple. This is large site of pilgrimage from India, Nepal and other countries as well. . Stay overnight in Muktinaath. Early morning go to the temple and worship the God and pray for good luck, good spirits, and all the positive things and trek back t to Jomsom because Jomsom is strong windy place in the afternoon. Even its windy you can walk around the village. 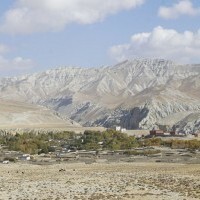 Jomsom is the districts headquarter of Mustang district. Stay overnight in Jomsom. Fly early morning to Pokhara and go for boating in Fewa lake and Temple in the middle of Fewa lake. If you have time to spend a few more days in Pokhara cause its really nice and clean city in Nepal. Fly or drive back to Kathmandu with great experience of 16 days trekking and walking in the mountain. Transfer to the hotel and stay at the hotel. Today is your last day in Nepal so by souvenir and present for your friend and family. 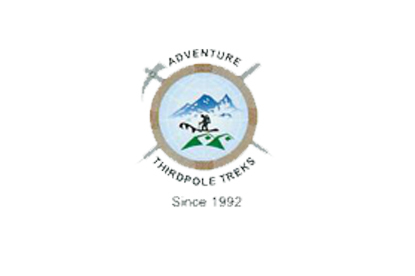 At the evening Adventure Thirdpole Treks will host a farewell dinner in Nepali typical restaurant in Kathmandu. Departure for your home with great experience in the Himalayan kingdom and such a memory of your life. 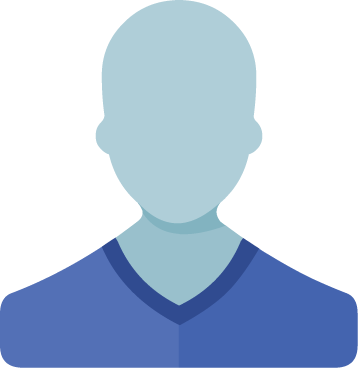 Friends' Email*	 Please separate multiple emails with commas(,).